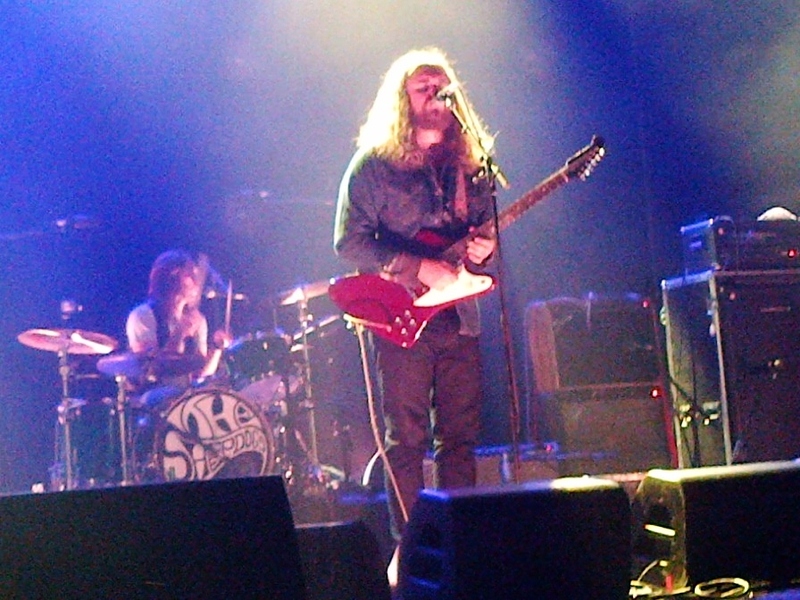 Following the Rolling Stone cover contest in the summer of 2011, I came to realize that one of the competing bands, The Sheepdogs, were from our very own Saskatoon, Saskatchewan - and was obviously immediately intrigued. Expecting slight musical talent and maybe an interesting "angle," I gave a listen to the singles from the disheveled and burly rockers' debut Learn and Burn with hopes that I would want to support the Canuck portion of the talent contest. The addictive few songs and Rolling Stone Session live performances led me to realize, from lead singer Ewan Currie's first wobbly baritone to scraggly guitarist Leot Hansen's searing riffs, that this group of revivalist rockers weren't messing around - they were in it to win it. Good thing they did. 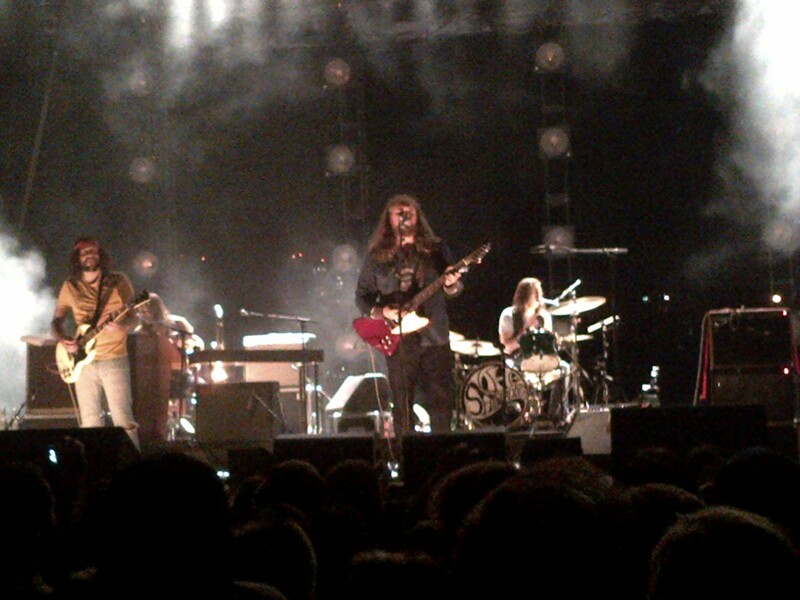 I was speaking to someone recently who happened to be abroad during The Sheepdogs musical inception - the contest, the win, the hoopla - and he mentioned that he kind of "missed the whole Sheepdogs thing" - which makes perfect sense. One minute, they were unknowns from the prairies, the next - they graced the coveted Rolling Stone Magazine cover and tore up the North American airwaves. Had I not been following their climb, I also would have noticed how the entire skyrocket happened in the blink of an eye. The test of their future longevity is already in the works, and looking promising, seeing as the scruffy quartet didn't droop below the radar after their hasty mainstream introduction. 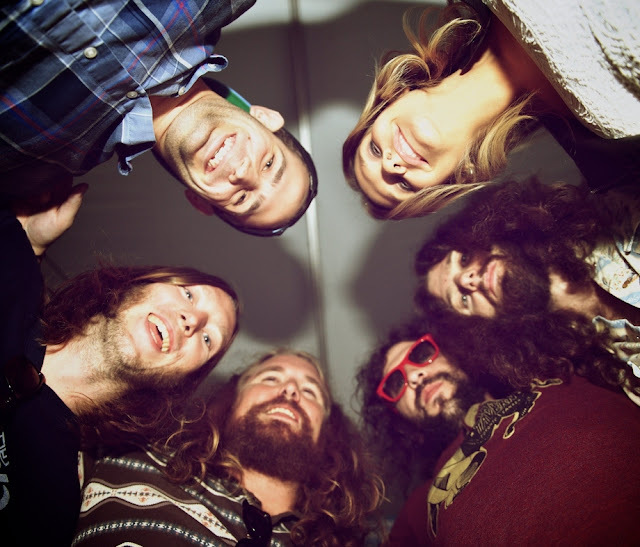 Back with a new self-titled major label album that was produced by Pat Carney of the Black Keys and features another handful of soulful rock scorchers - it seems that as The Sheepdogs embark on their US tour, they're only gearing up. On the new release, they sound composed, cohesive and accustomed to the scene already. Their music videos are entertaining. Their live set is explosive. They look comfortable in their distressed, but most likely expensive, rock threads. 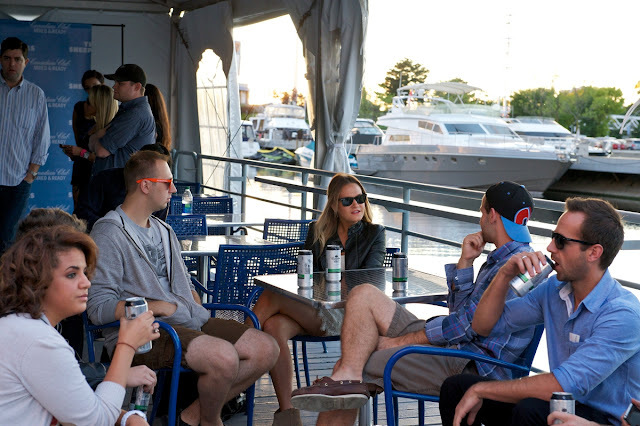 I know all of these things not only because I've continued to follow their musical journey closely, but also because I had the pleasure of meeting the four pals at last weekend's Echo Beach show in Toronto. Courtesy of Canadian Club whisky, I was invited to check out the show - which included opening acts The Sadies, Zeus and Yukon Blonde (amazing) - as well as greet the talented foursome prior to their taking the stage. Walking onto the docks alongside the Molson Amphitheatre harbour, The Dogs introduced themselves kindly, but warily, as if they were guest speakers in an elementary school class. This had nothing to do with their own sociability, but more with the fact that the two handfuls of people lucky to meet them were initially stiff as boards, sipping their CC Mixed and Ready tall cans and waving an awkwardly united "Hi" to the crew. If anything, their laid back demeanor and willingness to mingle with us put everyone's starstruck complexes at ease. I was more trying to think of a way to weasel in a quick conversation about the new album and how sizzling it is, without being that girl. The semi-stifling introductions continued into taking photos with the band, and when it was my guest and I's turn to shake their hands and capture our Kodak moment - we decided that considering we were before a group of free-spirited ramblin' men, there was no better time to suggest spreading a little love. So, naturally, we suggested a group hug. Not only was the band jubilantly on board, they were ecstatic when the photographer dove beneath our circle of heads to snap shots of the six of us from the ground up. 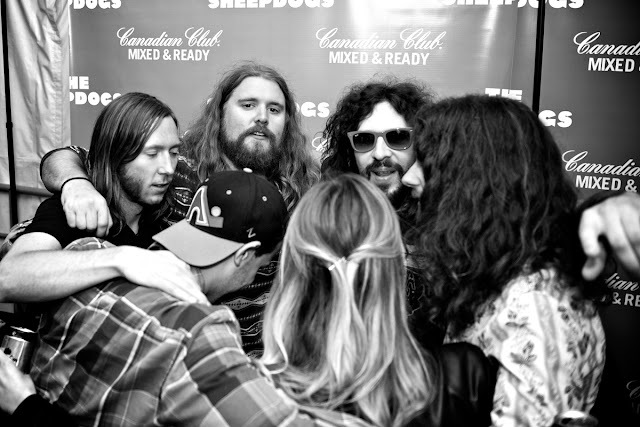 Maybe the "meet and greet" wasn't lengthy, but the Sheepdogs snuggle made up for it. Back on the concert grounds, rock-infused patriotism blanketed the sandy beach venue while the four homegrown acts opened up. Yukon Blonde finished up with a wholehearted excitement that had been publicized on Twitter a few days prior (@YukonBlonde: "JUST A FEW MORE SLEEPS TILL ECHO BEACCCCCCHHHHHHHH!!!!!!") - playing their harmonic indie rock hits "Brides Song", "Wind Blows" and the catchy new "Stairways" before hyping up the main act. Squeezing to the front was obviously the only option before our new pals opened their lengthy set with "How Late, How Long? ", raising the first few rows into crowd surfs and fist pumps. As with too many shows that I attend, I'm always amazed how some large portions of the crowd - through jams like "Alright OK", "Who", "Southern Dreaming", "The Way It Is" and "Please Don't Lead Me On" - are able to stand nearly motionless. I mean, maybe I make less friends by bobbing and wiggling to the contemporary classic rock ditties, but at least my concert conduct is in check - and at least I probably made my new best friends proud. The Dogs closed their set list with "I Don't Know" before leaning into the microphone, a little baffled, to say "Apparently we have to stop playing now?" - despite this being their cue for a heated encore. "But why don't we just play one more anyway..." they uttered rebelliously, sending the crowd leaping in their air while the opening chords of The Band's "The Night They Drove Old Dixie Down" chimed in and members of the opening acts strolled on stage to pair up at the standing microphones. Maybe they're still technically rookies, but they've learned one crucial lesson in their year and a half of early rock glory - the show isn't over until they say it is. Thanks for sending me, Canadian Club! I had an absolute blast. Livin the dream, Jess! Love the post.